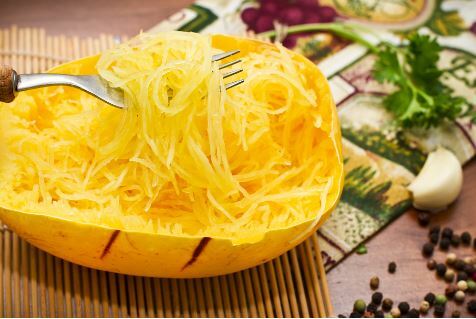 Spaghetti Squash is a really great alternative to gluten or any other grain pasta out there. It’s a healthy way to get in a craving for a hearty meal. Veggie noodles are becoming extremely popular in the cooking world, and spaghetti squash a great way to get into it. Trust me when I say you’ll want to make this a new staple in your kitchen. The possibilities with spaghetti squash are endless! Enjoy! Preheat the oven to 375°F. Halve squash lengthwise and use a spoon to scoop out seeds and discard. Place squash cut-side down in a 9×13-inch baking dish. Pour 1 cup water into the dish and roast until squash shells are tender when pressed with your finger, about 30 minutes. Let sit until cool enough to handle. Leave oven on. Meanwhile, pour tomatoes into a strainer set over a bowl. 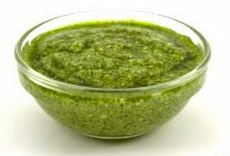 Set tomatoes aside and pour juice into a blender. Add almond butter, curry powder, and 1/4 teaspoon of the salt and blend until smooth. Pull a fork back and forth across squash in a “raking” motion to remove flesh in strands, keeping shells intact. Transfer squash to a bowl and toss with remaining 1/8 teaspoon salt. Return shells cut-side up to the baking dish. Spoon one-third of the squash into shells, dividing evenly. Top with half of the tomatoes and half of the greens, then drizzle with about one-third of the almond sauce and the olive oil. Repeat the layering. Top with remaining squash and sauce. Remove the squash, add the chicken, and then roast until filling is heated through and greens have wilted, about 15 minutes. Enjoy!